We talked with a number of major companies in the midst of their planning and strategizing for IMTS 2012, with the thought of determining just how much things have in fact changed for exhibitors regarding the trade show experience. Gear Technology's handy list of which booths to visit at IMTS 2012. A special advertising section featuring gear industry exhibitors at IMTS 2012. Capstan Atlantic, located in Wrentham, Massachusetts, produces powder metal gears, sprockets and complex structural components. The company has provided unique powder metal products in a variety of industries including automotive, business machines, appliances, lawn and garden equipment and recreational vehicles. Gear tooth wear and micropitting are very difficult phenomena to predict analytically. The failure mode of micropitting is closely correlated to the lambda ratio. Micropitting can be the limiting design parameter for long-term durability. Also, the failure mode of micropitting can progress to wear or macropitting, and then go on to manifest more severe failure modes, such as bending. The results of a gearbox test and manufacturing process development program will be presented to evaluate super-finishing and its impact on micropitting. The gear industry lost one of its iconic figures in July when James Cervinka passed away at the age of 92. Jim was CEO and one of the founders of Arrow Gear. For 65 years, he was a gear man, and I can’t help but feeling that his absence shrinks the gear industry by far more than the loss of just one man. Why traditional lean manufacturing approaches need to be adapted for job shop environments. Gleason-K2 Plastics eliminates weld lines with no machining. The complete Product News section from the August 2012 issue of Gear Technology. The complete Technical Calendar from the August 2012 issue of Gear Technology. 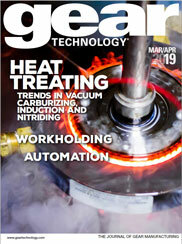 The complete Industry News section from the August 2012 issue of Gear Technology. The mind melds with gears for cycle project.